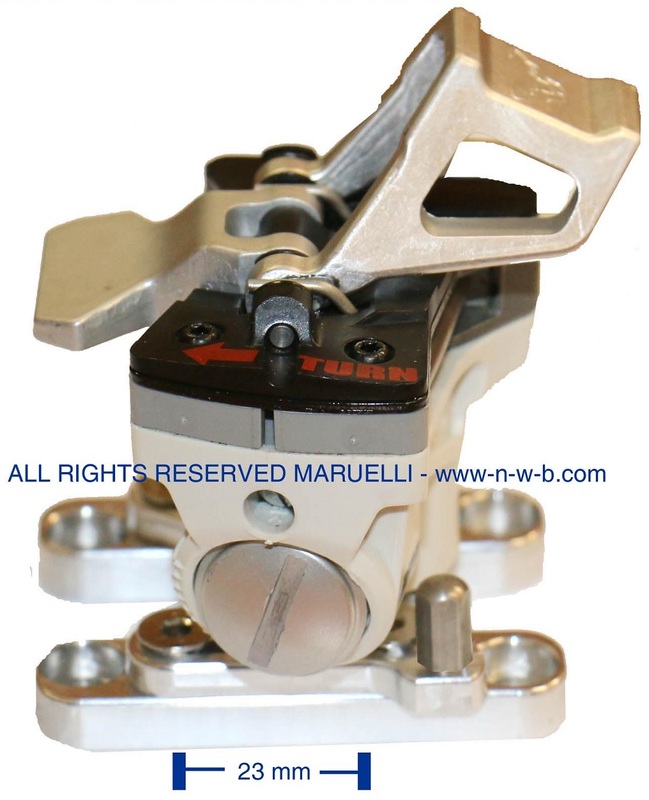 Maruelli is the Italian version of B&D, making useful aftermarket parts for tech bindings. They use the highest quality materials to ensure modified products are even more robust than they started. 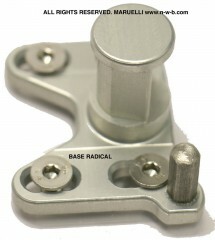 Find our growing list of Maruelli binding parts below. Speed Antitwist Base x2 – Machined out of Titanal, this heel baseplate/spindle for the Speed Radical binding has a metal post that prevents unwanted rotation while skinning. It mounts directly onto your ski, lowering the heel pins by 3.5mm for a flatter ramp angle. There is 6mm of fore/aft adjustment if you mount it with inserts. 37 grams (1.2 ounces) each, lighter than stock heel bases. Works well with Plum Guide screws (mounting). Maruelli recommends these bases on skis no wider than 80mm. 23 mm Base Tracks - Adjustment tracks that provide 23mm of fore/aft range for the Speed Antitwist. The tracks use the standard Dynafit heel pattern so they can be used as a drop in replacement for an existing heel tower. Made with the same aerospace-grade aluminum alloy as the bases, the tracks are 7.5mm thick and weigh 34g per ski with the included Inox (stainless) adjustment bolts. Two pairs per pack. 73 mm Base Tracks - Maximum adjustability for you Antitwist heels, with a total travel distance of roughly 73mm. 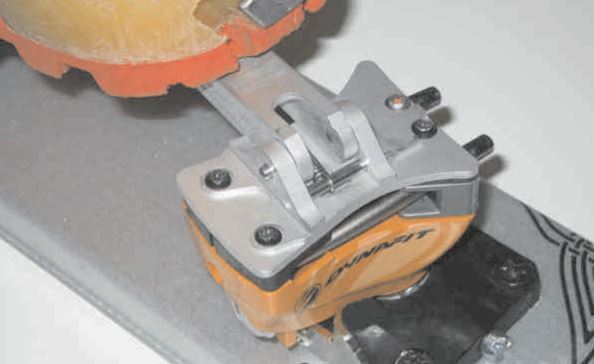 Mounting pattern is the same as Dynafit rental bindings so a standard jig works. The tracks are 7.5mm thick and weigh 47g per ski with top-of-the-line stainless steel (Inox) adjustment bolts, included with the two pairs of tracks. TLT Antitwist Base x2 - Replacement baseplates for the TLT Speed / Classic binding that prevent unwanted rotation into ski mode. Lighter than stock baseplates as a bonus. Not compatible with Speed Turns or Radicals. Click-Clack Risers - Flipper-style risers for the TLT Classic and Speed Turn bindings for those who prefer pole tricks instead of wrist kinks. Also decent replacements for broken Radical roofs. 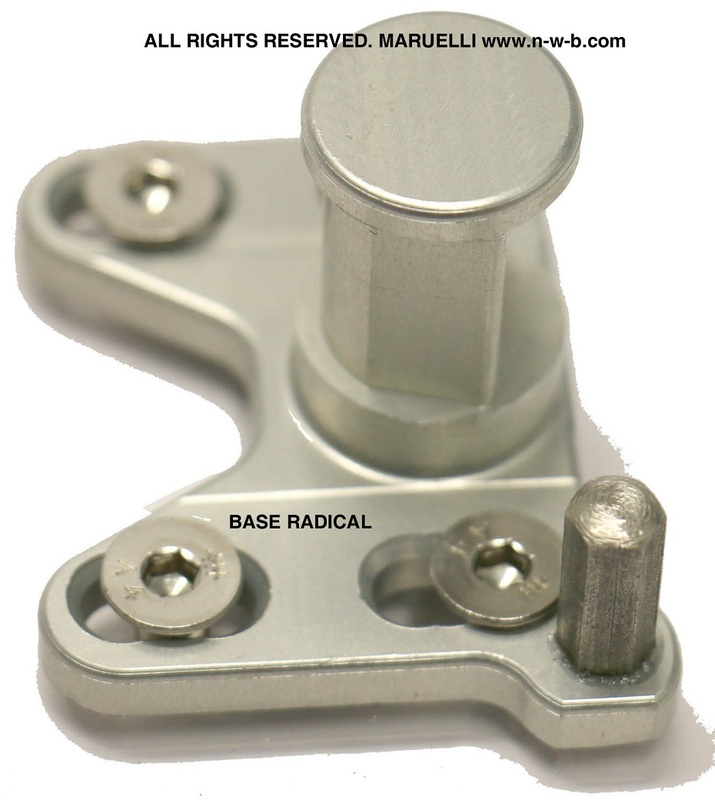 Radical Antitwist Locks - Metal brackets that slide into Radical ST or FT heel pieces to prevent unwanted rotation while in touring mode. Remove any legacy pins in the heel tower and screw on this final answer. Sold in pairs and come with Inox bolts. 27g per ski including hardware. Toe Spring - Coiled spring used in Dynafit-style toe pieces that handles the opening and closing of the wings. 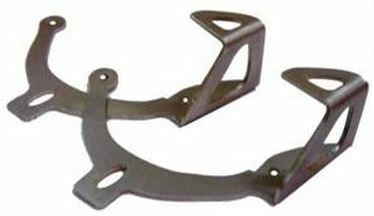 Toe Spring Coupler Set - Black plastic pieces that connect the left and right toe wings on many Dynafit-style bindings. Trab Heel Spring - The U-spring for Trab race heels, similar to TR-Race model. Trab Heel Spring Retainer - Twisted flat retainer bar that hold the U-springs in place on Ski Trab race heels. Leash Safe Loops x5 - Breakaway leash loops to ensure you skis don’t pull you down in an avalanche. Connect these somewhere along your leash chain and they will break when the right force is applied. 6 grams per loop, sold in packs of 5. Note these are the newest version that only require 1 loop per ski (previously they needed to be doubled up). Breaking force is around 75lbs. Installation instructions and mounting templates for the Antitwist parts can be found here. You can read more about the Antitwist solutions on WildSnow. Hello- will you have any 23 mm rails available fall 2018? Thanks in advance. Hi Andy, yes we will have more of those. Hopefully this month, but we don't have an exact date yet. Hi, I've noticed that there is no mention of the Click-Clack Risers in the drop-down selection box. Are they still available and if so what might be the cost? Hi Quone, we are currently out of stock of the Click-Clack Risers but have more coming next month! The retail price is $64.95. Will you guys have the maurelli click-clacks back in stock some day? Hey Eric, yeah we should have them back in stock soon. We'll be placing an order shortly and should have them a few weeks after that. Would you like me to put your name on a notification list for those? Please do. As I understand it, I could put these in place of the black tower on my Vertical ST. Yes? Hi Eric, you would need an anti-rotation mechanism for it to work without accidental rotation. Unfortunately there is "lots of unuseful plastic" in the way for one of those, according to Mr. Maruelli. Questions about a couple of items. I have Speed Turn 2.0 bindings, is the click-clack raiser compatible with it? I assume I would need to unscrew the top plate of the heel piece and screw on these, correct? 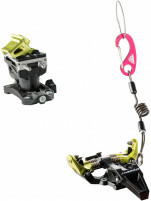 Two, has anybody tried these breakable links with the standard Dynafit leash? Are the holes large enough to clip in the Dynafit little carabiners? I guess I could use girth hitch to connect the link to the supplied loop, but then I'd have to connect to the wire on the boot... Anybody tried this system? Hi Anton, yes the click-clacks work with the Speed Turn 2.0 and they just screw on. The Dynafit biners fit right through the Maruelli links so that system works fine. Used "Maruelli Speed Antitwist Base" with Radical FT12 heels to go brake-less. The most obvious, as mentioned above, had to cut-n-file plastic fin that holds brakes closed while in uphill mode, pretty straightforward. The no so obvious thing was that the original titanal heel post from FT12 is about 4mm higher, so the heelhead (actual heel with the pins&springs that sits on the heelpost) sits higher and needs more clearance from the bottom. which is also not a big deal but wasn't expected. I'm re-mounting my Speed Radicals & Maruelli's base only onto a new set of skis. This time I want to use "Quiver Killers". I'm not sure if the "Quiver Killers" fasteners screws (pozi-lowhead) for the heal piece will work with my Marueli bases. It appears that Pozi-flathead M5 screws is what I need to use to screw down the Marueli bases into the inserts. Is this correct? It's hard to tell from the images. Also what length pozi screw would I use? I appreciate you help, much thanks . . .
Hi Jon, the drive type isn't critical, but you want 12mm M5 flatheads for that application. 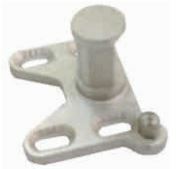 We have fastener kits in our QK listing. Hi Gary, they don't come with screws. If you are mounting with the Base Tracks, you can use the screws from your Speed Radical heels, or get more pan head Torx screws. You'll need 12.5mm Torx screws for a mount without the Tracks. Screws are here. Is it possible to get the ALU base of the Vertical ST heel unit? See photo. Hi Gaspar, I wish! That would be a nice item. Would the Maruelli Antitwist possibly work with an older Vertical FT heel unit, if the anti twist post was filed down? Would it turn in either direction like the old Vertical bindings. Hi Austin, it wouldn't turn in each direction since there is a post to prevent rotation while in climbing position on the Radicals. However that position on the Verticals is flat-on-ski, so in effect you would have no risers unless you also added the Click-Clack system from Maruelli. Would the Maruelli Antitwist possibly work with the Speed Turn heel unit? Hey Tyler, yes, the Speed Turn heel housing fits on the Speed Antitwist Base. However there are only two heel positions with this base: skiing & 90° clockwise. That second position is climbing mode on the Radical, but flat mode on the Turn. To be useful, you'd also need to install Maruelli's Click-Clack system to give climbing aid. 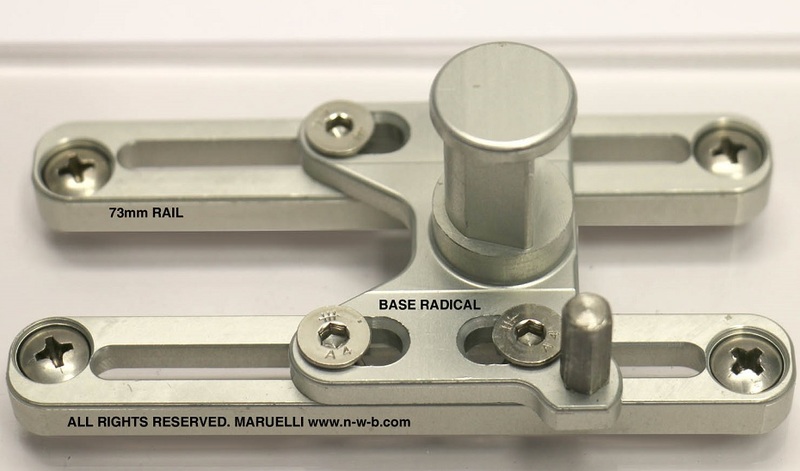 Wondering if the Maruelli antitwist base plates can be used to convert a Radical ST to a kind of a Speed radical i.e. sans brake and plastic base plates etc. Yes David, this can be done but requires some modification. The plastic protrusion near the base of the ST/FT that holds the brakes up in touring mode will hit the anti-twist post. It needs to be cut off (better) or filed down (often good enough).  There is a picture of a filed orange FT here.